Boost your health and productivity by putting Updezk raisable desk in your office! Scientists claim standing to be much more efficient way of working than sitting. Statistics shows that those who stand during their work days are 71% more focused and 62% more efficient than their peers who sit. Using an ergonomic adjustable standing desk is a good way to be fit (6 hrs of standing helps you to lose up to 100 calories). Updezk standing computer desk with adjustable height is not just a healthy desk for your office, but a stylish one. The slim surface looks innovative and modern, and there are 2 colors to choose from. Black standing desk look gorgeous with dark monitors while white ones fit perfectly for Mac Systems. It's easy to adjust standing desk in standing or sitting positions. Thanks to gas spring, it only takes up to 3 seconds to change the position of the best sit stand computer desk. You can also adjust it to your height to make your work as comfortable as possible. If there are some kinks, breaks, or other things that you don't like about the standing computer table, we will repair the damage or give your money back. It's important to us that our clients are as proud of their new sit stand desks as we are. If you have any questions about how to order, when the desk arrives, how to use it etc., feel free to contact our support service. Our agents will answer your questions anytime. ADJUSTABLE DESK - GOES UP AND DOWN. The standing desk converter can be adjusted for standing or like a regular one in the blink of an eye. There is no shifting when you change a modification. ADJUST YOUR MONITOR STAND FOR DESK TO YOUR HEIGHT. With desk riser, you can create the most comfortable version of your working process. The minimal height of the best height adjustable standing desk is 1.3 inches and the maximal is 16 inches. UPDEZK SIT-STAND WORKSTATION HANDLES HEAVY STUFF. The load capacity of standing workstation is up to 22 lbs. Desktop space: 22 x 31 inches. TWO COLOR OPTIONS AND FANCY DESIGN. 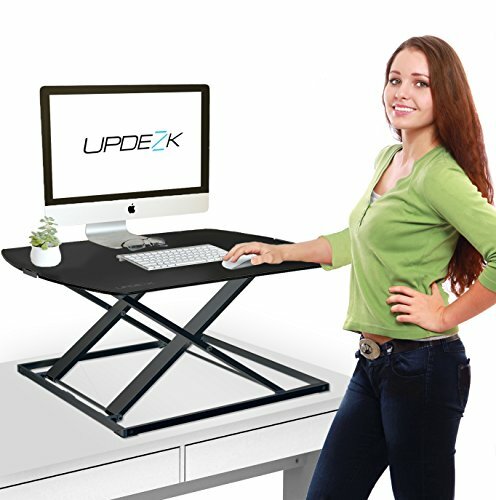 Updezk sit stand desk has ultra-slim surface so you can easily put it in the bag. We also created 2 colors to choose from - black is a perfect fit for dark monitors, and white fits better for Mac Systems. 2 YEARS WARRANTY. We would like for you to be proud of our sit stand raised workstations as much as we are. That's why we offer the 2 year warranty - if a client doesn't like something about the standing desk, we give the money back. If you have any questions about this product by UPDEZK, contact us by completing and submitting the form below. If you are looking for a specif part number, please include it with your message.